When it comes to making your own cleaning products, beauty products and household helpers, one thing that is often called for is liquid castile soap like Dr. Bronner’s. Usually people are shocked by the price of it and get turned away from buying it and thus, give up on doing things themselves, While it is true that Dr. Bronner’s is often expensive, it is kind of relative. Since Dr. Bronner’s goes a long way and is concentrated, it really is, use-for-use, very low cost compared to what you would spend on store bought cleaners and beauty products. However, if you are like me, you just know there is a cheaper way to do just about anything and castile soap is no different. Turning a bar version of castile sopa into a concentrated liquid is very easy and take little time or extra ingredients. I found the cheapest way to do this is using Kirk’s Castile Soap. It is around $1.25 a bar and is often bought in packs of three. I found mine at Fred Meyer for just over $3 for all three bars so this had me all kinds of giddy. 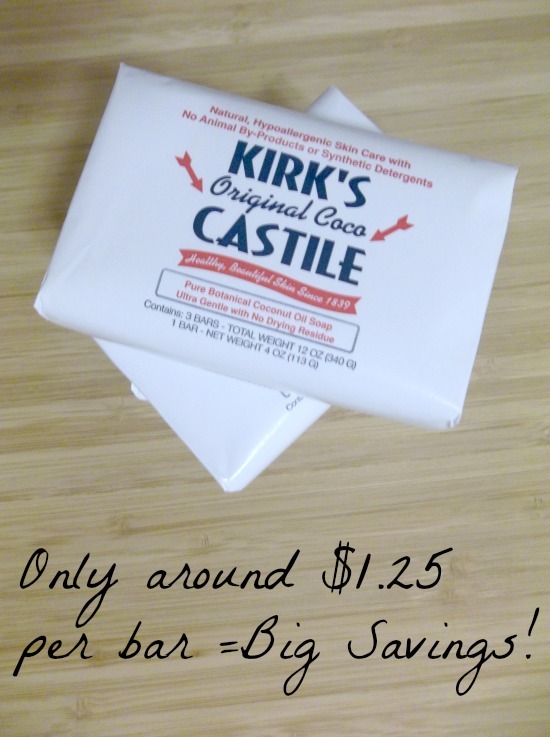 You can also order Kirk’s Castile Soap online if you cannot find it in a store near you for a bit of an increase in price, but still much cheaper than Dr. Bronner’s. This soap concentrate can be used in any recipe that calls for liquid castile soap, but since it is so concentrated, use a little less. For instance, if you are making my soft scrub recipe, use only 2 tbsp as opposed to 3 1/2. Kirk’s Castile only contains a couple ingredients so I love how natural it is and it smells great, too! Start by boiling the water in a tea kettle. On a cutting board, cut up the bar into small chunks. You want them as small as possible. You could also grate it, but I find cutting to be much faster. It cuts really easy and is not hard. Place the soap in a glass bowl or container. When the water boils, measure out just under 3 cups and pour over the soap. Give it a good stir and let it sit, covered for about 20 minutes. Every once in a while, go give it another gentle stir to make sure the chucks all melt. At this point, add the glycerin. The glycerin will help it stay more liquified as opposed to a gel. 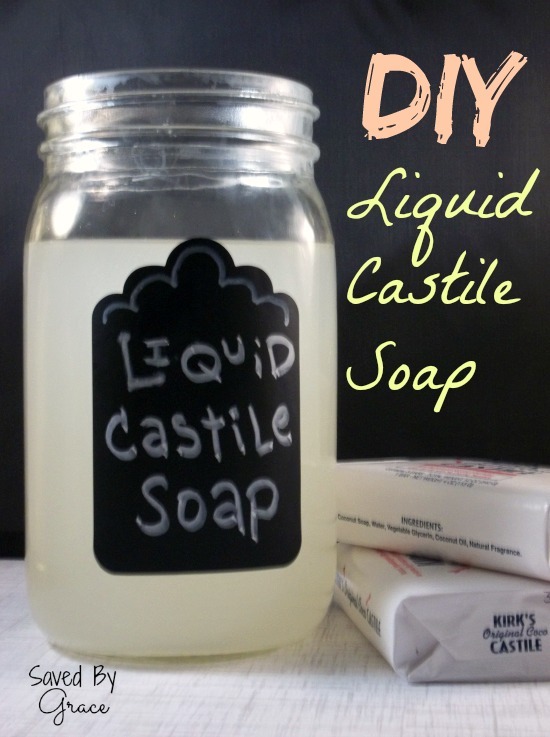 When all chunks are melted, pour into a glass mason jar, label it and you have your liquid castile soap! Add 10-12 drops Tea tree oil for disinfecting properties if you will be using it for cleaning. 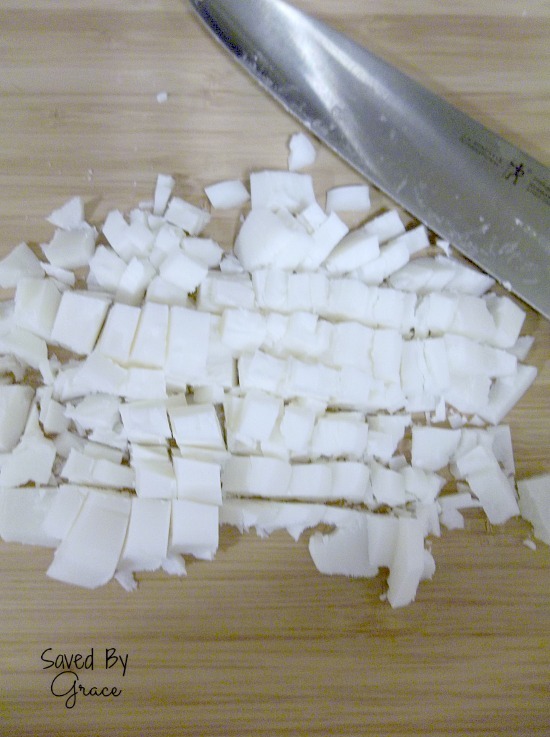 I grated the entire 5oz bar of soap on a box grater. I added 4 1/3 Cups of boiling water into a BIG Pyrex measuring vessel along with 4TBS of glycerin. Thank you for being such a great community and helping to come up with a solution! Cool DIY recipe! I wish I had more talent and creativity to come up with some of this stuff! 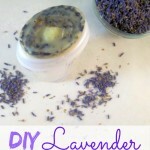 This is a great tip for those who like making homemade cleansers and such but don’t like the upfront cost. Always nice to know how to shave a few dollars off the cost for ultimate savings! I am feeling out of the loop since I’ve never heard of castile soap. 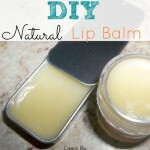 I guess I need to get to making more homemade beauty products and cleaners! Castile soap is amazing, Kecia! 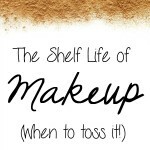 You will be astounded on how much you can save by making your own cleaners and beauty products! I’ve never heard of it either, but this looks simple enough that I’m definitely going to start DIY’ing some of my cleaners! I will def. share this post with my mom.. she is really into this kind of thing 🙂 I usually just get some of whatever she ends up making .. the only thing I can make is a mess even if I have instructions most of the time. Great tip! I have some Dr. Bronner’s bars left over and now can do something better with them! Just use a little big extra of water (I would say about a 1/2 cup extra) since Dr Bronner’s soaps are 5 oz and Kirk’s are only 4 oz. Let me know how it turns out! I’ve found myself turning more to DIY lately ( college grad with no job lol). This looks easy and cost productive! It’s definetly the way to go for frugality reasons! I have to say I have never heard of Castile Soap before! This is a great DIY recipe, though! Sure! I think no one should pay more for something that they can make themselves! This is helpful. Thanks for sharing! Hello from T.G.I.F. Linky Party! I loved this idea and made it right away because I already had the ingredients. It has been a couple of days now and I have a mason jar full of gelled castle soap. I did use Dr. Bronner’s and added the extra water like you suggested in a previous comment. Can my soap be saved? What would you or anyone on here suggest? Thanks so much for the awesome idea..
Hmm, I would just add a bit more hot water and maybe shake it up. I used the kirk’s castile and mine is very much still a liquid. Let me know if that helps you! I tried this too, and when it gets kind of gelled, I use a hand mixer to break it up, seems to help a lot. Hope this is helpful for you! I find I need the more concentrated version because my husband doesn’t believe that suds don’t equal clean, so he refuses to use the homemade stuff either. I find myself having to do more of the cleaning now because he will not use homemade products, even with the baby girls we have (okay the 4 year old isn’t a baby anymore, but she is my baby). Just wish I could afford to stay at home! hmmm. this is a GREAT idea. i was about to go online and purchase one of those big dr bronners bottles and checked on pinterest first to see if i could get around it and found your post! it seems too good to be true with the huge price difference, but im totally trying it anyway! i wonder how this recipe would hold up against a recipe with the actual liquid castile soap. Hi Cat, I have used this and I personally think it works out pretty well for most things you would use Dr Bronner’s in. The only thing is, it can separate over time, so make sure to shake it before use. Hey, so I have been looking through different recipes for turning a bar of castile soap into liquid. Recipes vary greatly between adding 3 cups of water per 4 oz bar…. all the way up to 8 cups of water for one 4 oz bar. Do you happen to know if your recipe is the same concentration as it would be if I did buy a liquid castile soap? The reason I ask is for diluting purposes when making things like cleaners and whatnot. I don’t know exactly, Shannon because I don’t know the concentration of Dr. Bronners. I can say this is a little bit more “watery” than Dr B’s in my experience. I tried making a similar formula without the glycerin it’s great for my glass ware but leaves a white film on my pots/utensils and wooden spoons. any info on that one? I am not sure. Do you have hard water? That can present a problem sometimes with castile soap. Hey Christine…can this recipe be used for body wash as well? I know you mentioned cleaning, but I’d like to use it as my body wash like I do Dr. B’s. I haven’t used it in that way, but I often use Dr Bronner’s to wash with so I imagine it might work the same way. I would maybe use less water so it is more concentrated, maybe? I would think that would help it suds up a bit more like body wash does. Let me know what you think it you try it this way. I have the opposite problem! Love both Kirk’s and Bronner’s and have used them sporadically throughout the years and will most definitely try your fabulous recipe to save $$$. Thank you! But now 1/3 bottle of my liquid Bronner’s has congealed at the bottom of the bottle and I put the plastic bottle in boiling water but it still didn’t melt the soap tho the plastic started to buckle and swell! What now?! I don’t want to toss it. Princess, I am not quite sure what you could do with it as I would suggest what you have already tried. I haven’t had that happen before and couldn’t find anything when I did a quick Google search. THANKS. But there has got to be a way to revert it to pure liquid form instead of a solid glue gel. This is frustrating! Well let me know if you find a way! 🙂 I am sure it will happen to me one day! I did this and my soap never got thick just runny. What am I doing wrong? It won’t generally be as thick as a commercial castile soap like Dr Bronner’s. Did you try shaking it up a bit gently? You could try adding a little more soap if you want it a bit thicker. Also, for those that have that white film when washing glasses… A quick dunk in 10% white vinegar rinse does the trick .. Or add white vinegar to the “rinse aid” compartment of your dishwasher. 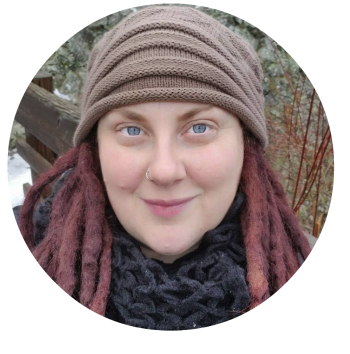 Thanks to every DIY’er here, especially to you Christine! Now, off to make your soft scrub recipe! Honestly, Elandra, I am not sure if it’s too late. You might try heating it up again and adding it and seeing if that works? You cam add glycerine at any time. I’m new to some of this. Where would I get the glycerin called for in the recipe? Hi Leigh Ann, You can get glycerin at natural foods stores, craft stores and on Amazon. 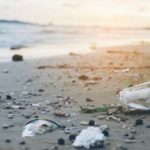 Hi Georgeanne, I have edited my post to include some reader’s comments. I personally did not experience this issue, but it could be that I am using it fairly quickly after. I am also told that elevation at which you live can have something to do with it. That was supposed to say a better emulsion! Great instructions! Do you think this would work with the Kirk’s fragrance-free soap bars that come in the blue-ish packaging? just wondering,does the soup have to be stored in glass? will plastic work? lol,that`s soap of course, i ve got soup on the mind. Can I use this as a base for homemade shampoo? I am not sure if you can as I haven’t used it for that. I definitely wouldn’t use it alone as it could be drying. Hopefully another reader has done this and can chime in.